All day I was watching the sky out west. On my morning ride it was sunny, but you could see the clouds amassing – the forecast was calling for thunderstorms. By 2 in the afternoon, huge, ominous black clouds where right on top of the city and I thought we were done for – my chance to ride with Gary Fisher was going to be rained out. Somehow though, that bank of clouds rolled by us, letting go of only a few scattered drops and at 7 pm it was sunny again and I was sitting on my bike next to the man himself. For a mountain biker like me, meeting Gary Fisher would be like meeting Jake Burton (Burton snowboards) if you were a boarder, or Richard Petty if you were a car buff. Fisher was there at the beginning of it all, building the first ever mountain bikes with his own hands and went on to create one of the best known brands in cycling today. So, yeah, as far as biking goes, he’s a pretty big deal and you never really know what to except when you get a chance to meet someone like that. You know the name, you know the brand and bikes, and you know the history but you don’t know the man. You wonder if your expectations will be met – if he’ll be as cool as you hope. 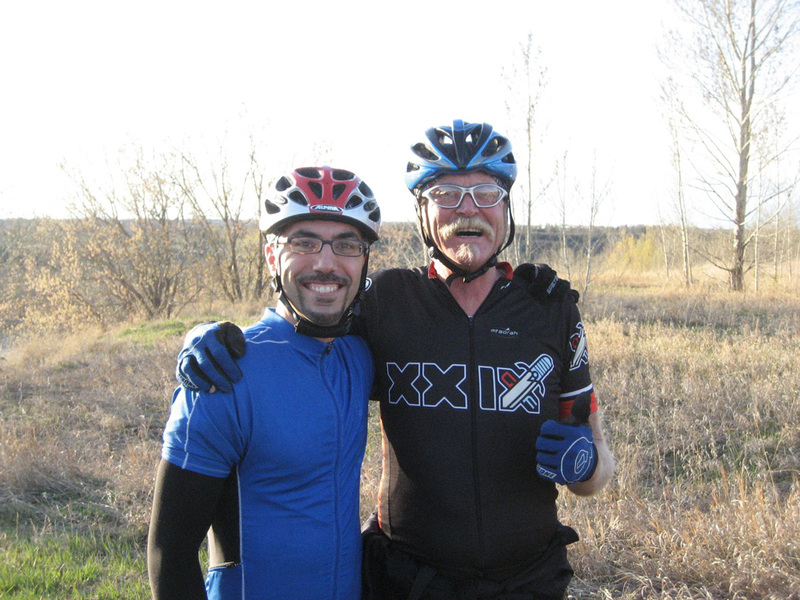 The ride, and the presence of Gary Fisher in Edmonton, was organized by a great bike store out of Sherwood Park (the suburb where I grew up) and was part of a fundraiser for the children’s Make-A-Wish Foundation. So, after some quick ceremony, introductions and a group photo to commemorate the event, we rolled onto the trails led by one of the Mud Sweat and Gears team riders. 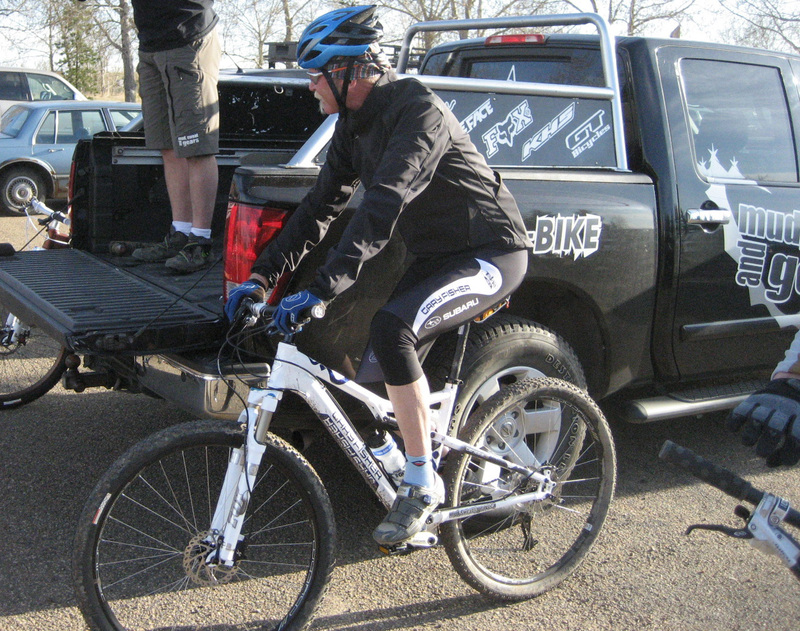 Gary, a tall and lean figure, kitted out in Fisher/Subaru gear and riding a sweet Hi-Fi Deluxe 29er merged in with the middle of the pack. The group was probably 30 in size and the skill levels varied so the pace was pretty moderate, but the trails were surprisingly technical. It was my first time riding them, and I’d go back again for sure – tight and windy, with lots of steep downhills and quad-burning climbs. I rode right behind Gary for a good part of the time. At 59 years of age, he’s 25 years my senior so I didn’t really know what to expect but he rode every bit of trail we came across, and with a lot more flow than I did, that’s for sure. He made everything look easy. It was cool to watch. Experience, you just can’t deny it. Part way through the ride at one of the breaks, I had the chance to talk with him for a bit and found him to be an incredibly friendly and easy going guy who was more than happy to talk about whatever. It turns out he still rides everyday back home in San Francisco and told me about routes he likes – one called the “Wiggle” for example. After the ride, we all headed back to the Mud Sweat and Gears bike shop for pizza and Stellas where Gary hung out, chatted, signed jerseys and bikes. My buddy John Connors got his vintage, electric green Gary Fisher Tequila signed. I got my jersey signed. It was awesome! There was also a draw for a brand new Fisher commuter bike; Gary does a lot of advocacy for the community of bike commuters. You have to tip your cap to that. So, was Gary Fisher as cool as I’d hoped? Nah, he was way, way cooler. Thanks to Mud Sweat and Gears for makin’ it happen! Cool! Sounds like quite the experience! Super awesome dude, I’m jealous!! It was a GREAT experience… glad we got to do that together Sheldon. @ Johnny: One for the books!!! !